I was recently browsing the book, Old Burial Grounds of New Jersey, by Janice Kohl Sarapin, while looking for potential information on ancestors of mine who lived in New Jersey in the 1700 and early 1800s. While I didn’t find what I was looking for, there was one chapter titled, “Ghost Stories and Legends” that caught my eye. 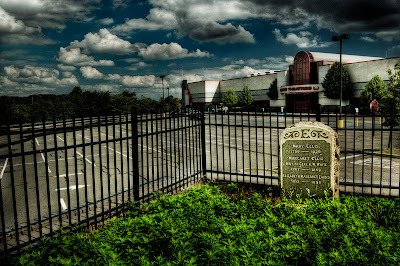 In particular, I was fascinated by a section called, “The Gravestone in the Parking Lot.” The author describes the curious case of Mary Ellis, whose body currently resides in the middle of an asphalt parking lot outside an AMC Loews 18-Theater Cinemaplex in New Brunswick, New Jersey. 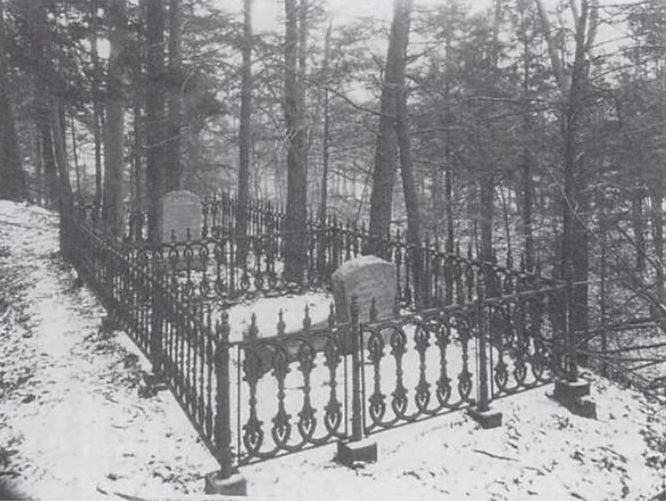 Her story was rather compelling, so I did a quick Google search and the image of Mary Ellis’ grave, below, popped up. 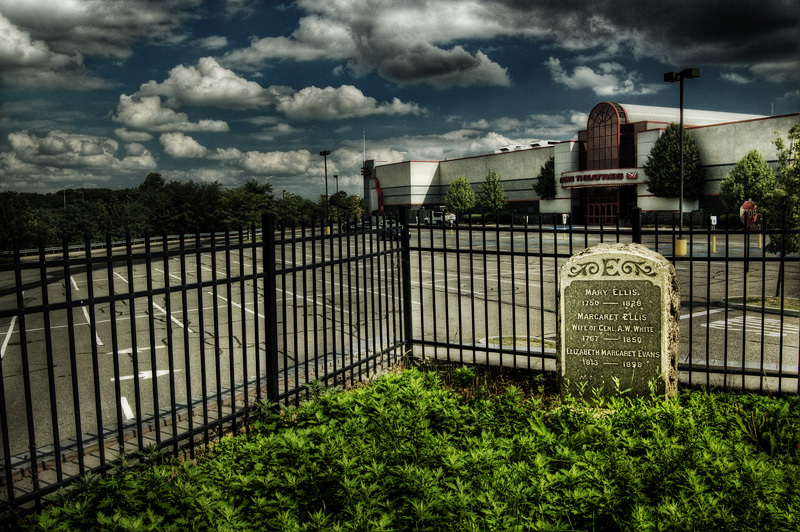 While the appearance of a grave in the middle of a movie theater parking lot is odd enough, the story behind the grave is equally interesting. Supposedly, in the 1790s, Mary came to New Brunswick, New Jersey, to live with her younger sister, Margaret White, the wife of Colonel Anthony White. Shortly after coming to New Brunswick, Mary met and fell in love with a former Revolutionary War officer turned sea captain, but soon after their romance developed, the captain left on a voyage. Professing his intentions for her, he put his horse in her care, sailing down the Raritan River, and out to the Atlantic. Every day he was away, Mary would go down to the river and look for her captain. In 1813, Mary bought a piece of farmland near her sister along the river, but continued her daily vigil. Sadly, he never returned, but she continued watching for him until she died in 1828. Mary was buried in the secluded woods on her property with a view of the Raritan visible from the gravesite. The land was sold and resold over the years. In the 1960s, the woods were cleared, the ground was scraped and graded lower to allow for a parking lot for a discount store. Fast forward a few years, and the site housed a discount store, flea market, and finally the movie theater occupied the site. 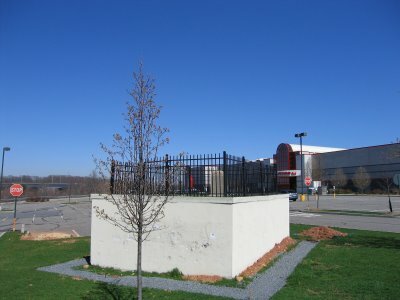 The entire time, Mary’s grave remained in the parking lot, but with each successive grading lowering the parking lot, her grave appeared to rise, so that it now stands about seven feet above ground level. 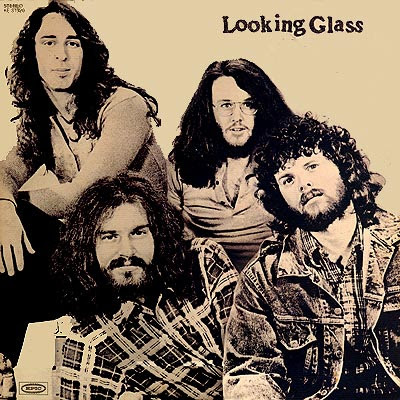 There are a lot of people who believe that Mary's story inspired the lyrics to the 1972 song, "Brandy (You're a Fine Girl)" by the band Looking Glass, since the band is also from New Brunswick, New Jersey. I shared this information with my history classes today and then said, “So you see, Paso Robles isn’t the only town with people buried in their parking lots.” The students did an immediate double take and then I realized that they were too young to remember the fight over the Wal-Mart parking lot. Just a short drive down Niblick Road from the high school where I teach in Paso Robles is the local Wal-Mart. Back in 1993, when they were building the place, workers discovered a skull a a couple bones believed to be Indian remains in a little mound on the site. The developer initially wanted to flatten the rise and pave over it to allow for more parking and better visibility from the road. Some Indians found out about it and sued the developer. Wal-Mart eventually stepped in, talked to the developer, and preserved a pretty large section in the middle of the parking lot. 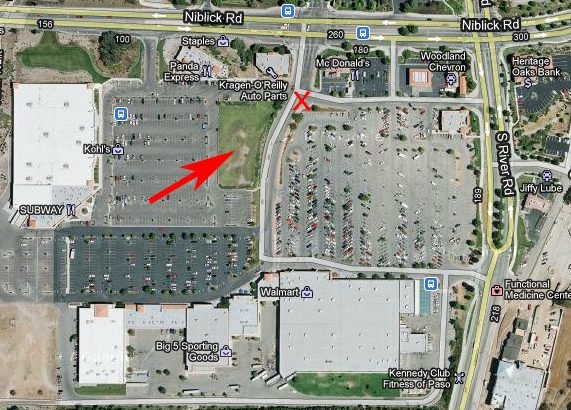 It now sits there, a large grassy knoll surrounded by shopping stores, fast food, and parking. 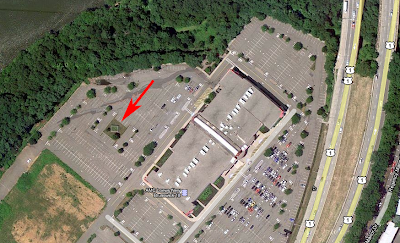 I find it a little odd to find people buried under parking lots. I recall when our family visited Edinburgh, Scotland, we visited St. Giles’ Cathedral where the famous Reformer John Knox (the founder of the Presbyterian Church) preached. After seeing many memorials and markers for important people, my father asked where John Knox was buried. 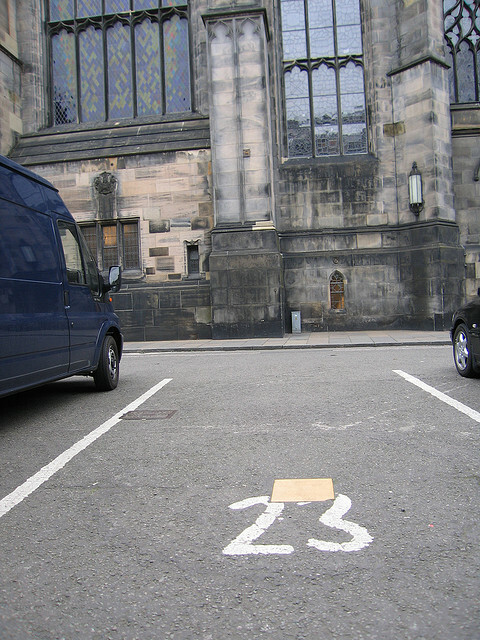 The minister informed him that he was buried in the parking lot out back under space 23. Sure enough, the graveyard had been paved over to provide for parking and there was now a little plaque marking the resting place of Knox. Somehow it just doesn’t seem right, Mary thinking that her body would be forever in the woods looking towards the river. Or Knox who was buried in the sod of a quaint churchyard, only now to lie covered with asphalt and motor oil drippings. Have any of you found other odd burials? What a great and interesting history lesson! Fascinating! I’ve never seen anything like this before. Who knew and thanks for sharing such very interesting story. It would be interesting to know how many people are now residing under parking lots around the world. You sure make history interesting, Nate. I did have one ancestor patially buried under a cemetery road in Ohio. Seems people kept cutting a corner too sharp until only the headstone was still on the grass. I see Roger is having fun with Science & Cooking on 'Bridger's Snippets' Blog. So sad. We look for an empty spot near the door and don't see anything else. 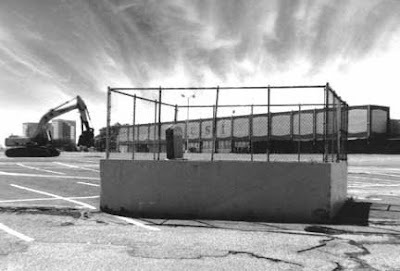 I loved this post - thank you for such interesting glimpses into what are "non-interesting" places such as parking lots. You might in turn be interested in learning more about the Pointe-à-Callière Museum in Montréal, Canada. The mkuseum itself is a site of archeological significance in that is situated above an original settlement cemetery. Mary, thanks for the tip. I called this morning, but it was already too late, all the atlases were gone. Astrocrabpuff, I probably would very much like that museum. I love both archaeology and history and it looks like this one has both! There is a small cemetery in the parking lot of our local Home Depot! I have watched the area build up over the last 30 years but that little cemetery has never been disturbed. I thinks it's wonderful! I spent my teen years just outside of Atlanta, a little place called Avondale Estates. Avondale High School was right next door to what was then Columbia Mall (which was later renamed Avondale Mall and has evidently been demolished now for a Super Walmart). I spent many, many hours at that mall after school and got my first job there. 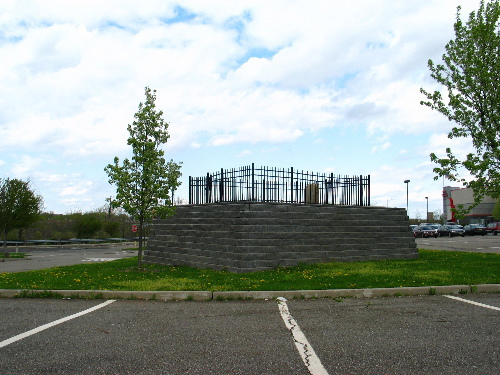 There was a fairly large mausoleum in the parking lot that fascinated me. It held the cemetery of the Crowley family who had first claimed the land in the early 1800s. Their descendants evidently owned the land for the next 150+ years and then leased part of it for the building of the mall on the condition that the cemetery would be preserved. There are 7 adults and 4 children buried there. What is especially sad to me, though, is that there were also some 40 or 50 slave graves just outside the main family cemetery and no effort was made to preserve those, because it was the late 50s, early 60s and I guess they were deemed insignificant. We have some Indian mounds in our area..some were (are) on my Uncles property as kids we would venture out there in the dark and talk of scalpings. Nifty stories everyone. Thanks for posting. Anon, in what town is the Home Depot located? It would be fun to see photos. Bound4Glory, I looked at the Crowley mausoleum photos on line. Looks like it was actually pretty well done. Same idea as Mary Ellis through, putting the graves at the original grade. Regarding the slave graves, a lot of time it's very hard to identify individual unmarked graves (whether pauper or slave). I've seen a number of older cemeteries that were marked with wooden markers that have long ago disappeared and there's no intent to forget, it just happens when there's no record. Same thing with old Quaker cemeteries, many old Quaker cemeteries were marked intentionally with simple uninscribed rocks or just an initial or two - very hard to tell who's who. Far Side of Fifty, sounds like fun times! I agree that Mary Ellis' fate is a sad one, but hopefully this might give everyone some comfort. I live in Central NJ, about 30-45 minutes drive to Mary's gravesite. I've been there many times over the years. She and her site are well known around these parts, and both her memory and her final resting place are treated with dignity and respect. Ken, thanks for giving a local perspective. I appreciate the feedback. Great info on Mary Ellis's grave site. I remember going to that parking lot in the mid 70's, and looking down at the grave (then two headstones were in place, both facing toward the Raritan River). At that time the grave(s) were well below grade, and at the bottom of a concrete "shaft", about 10-15 feet down. Perhaps either the parking lot was re-graded to be lower (bringing the grave marker above grade), or more likely the "shaft" was infilled with earth and the stone was moved and brought to grade level. Larsa you are right,in 1976 i worked at the U.S.#1 flea market and we went in to the grave,cleaned out all the vegatation and brought the headstone to the top.The grave was 12 feet below the parking lot.The concrete shaft was filled with dirt and the headstone was placed on top.And there was only one headstone,not 2 as other people have said.three members of the family came by to place flowers on the grave ,there was two elderly women and a elderly man. super interesting! actually where i live, there is a call center that has a large up-raise plot of grass that i believe is fenced in and has several graves in it.... super weird. i think once it was a family farm and it is that family's loved ones buried there because there is also a very old, decrepit house just in front of the call center as well. I was driving by Mary's grave today so I decided to stop and visit. I grew up nearby and saw her grave many times but it looks much different today and much better than it looked in the 1970's and 80's. I was glad to see it being well maintained.